Going back a fair few years I suppose one of the families of mushrooms I first started experimenting with as a forager is the very large Russula or Brittle Gill family. I had already learnt the basics, the most obvious, safest and well know mushrooms, and I suggest everyone starts with those. 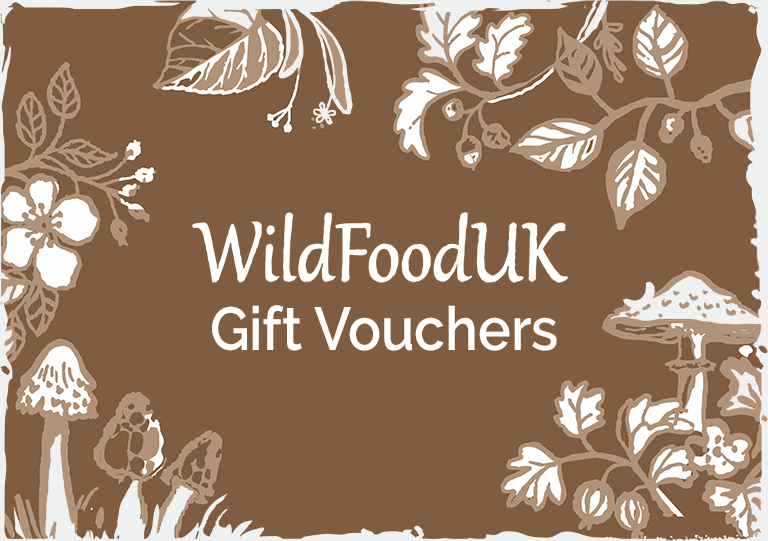 See our wild mushrooms for beginners article Though spending a bit of time learning a bit about this family has probably enhanced almost every fungi foray I have been on since. Identifying the Russula family (in most cases) is pretty easy, they are very common, very colourful and lots of them are edible! The Russulas are often overlooked as as edible option in the UK. Though in other European countries some are collected regularly for eating, and I consider a few of them to be very good edibles. 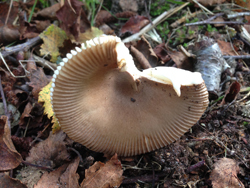 Caution is required when collecting Russula as even in the UK some can make you quite ill. The Geranium Scented Russula is listed as poisonous by some sources and The Sickeners or Emetic Russulas do as the name suggests. There are no deadly poisonous members in the UK. Though one family member (Russula subnigricans) found in China, Japan, and reportedly even the US, has been listed as deadly. By sight it can be extremely hard, if not impossible to tell exactly what Russula you have found without the aid of a microscope; but in the UK at least, there is a simple edibility test that applies to the whole Russula family. Before you can test a Russula to see if it’s edible you have to be 100% sure you have a Russula! There are at least 200 species of Russula in the UK. There are a huge number of different coloured caps within this family making individual identification very difficult and many other completely different mushrooms can look similar, Death Caps for example have a white stem and gills, a colourful cap, are of a similar size, and the veil can wash off to leave a reasonably Russula looking mushroom! The Milk cap Family too can look similar and are in fact closely related having rounded cells that are also brittle. First spotting a Russula can be quite easy due to their normally bright coloured caps. 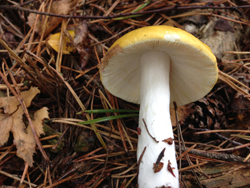 The common yellow Russula being one of the most frequently found mushrooms in the UK due to the way its bright yellow cap stands out from the forest floor. The caps are generally very round and with some exceptions they are generally one bright colour. Red, yellow, purple, green, white and grey are all fairly common, with numerous shades of each. Most stay medium sized in mushroom terms. The cap normally won’t get more than 8cm in diameter, though again there are many exceptions to this. Height wise 6 – 10 cm is the norm for mature specimens. None have rings or skirts on the stem, and none grow from an egg sack. All have reasonably stout, straight stems up to 2cm in diameter, but never thin or hollow unless slug eaten. The stems often resemble a bit of white chalk. They are firm though grainy in texture and snap in a similar way chalk too. They are normally white, though again there are a couple of exceptions to this rule. 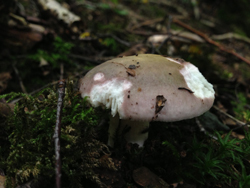 A bit of knowledge about the Russula family history will help with the rest of your family ID. The Russula family broke away from the rest of the fungi world millions of years ago and decided to go on its own evolutionary path. While on this path they developed a rounded cell structure whereas most mushrooms, and in fact most living things are made up oval not round cells. These round cells have a t angible effect on the Russula family, as have a completely different texture (when raw) to most other mushrooms. The only other common family of mushrooms that shares this cell structure is the Milk Caps. This family of mushrooms are even easier to ID than the Russula though as they will exude milk of various colours when damaged. 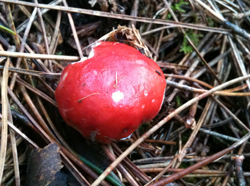 The Russula family do not ever exude milk when damaged. Basically round cells do not hold together as well as oval cells, and because of this the stem of a Russula will snap a bit like a piece of chalk. The flesh of the stems is also more grainy to the touch than other mushroom flesh. 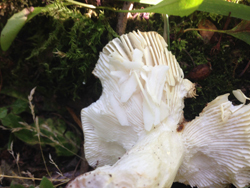 The Gills of a Russula which are almost always white will also break in a different way to other mushrooms. If you draw your finger over them they will flake a bit like almonds (As shown on the right) instead of going floppy or springing back into place. I know I’ve said there are exceptions to each of these rules, but there is only one exception to the flaked gills test, and that is the best edible of the lot. The Charcoal Burner, or Russula Cyanoxantha, which has less brittle gills than all the other members of the family. 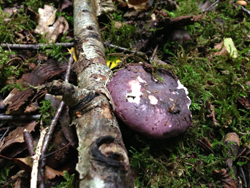 Ranging in colour from greenish to purple and often slightly cloudy, it is it is similar to lots of Russula; but if you run your finger over the gills of the charcoal burner they shouldn’t flake. 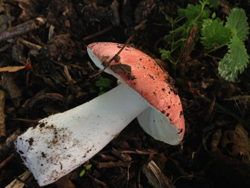 Once you are 100% sure you have a Russula, you can then carry out the test to see if it is edible or not. This is also a test of bravery the first few times you do it :). So again ONLY if you are 100% sure you have a Russula! Have a tiny nibble of the flesh and leave the slightly chewed bit on the tip of your tongue for about 15 seconds. If you start to feel a burning a bit like a hot chilly then spit it out. Doing this with even the most toxic Russula will not harm you in any way. 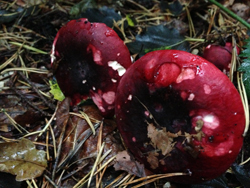 There are a number of Russulas not to eat, the Sickener and the Beechwood Sickener stand out, not only because of their name, but because they are both bright red. Red is a well known warning colour in nature, so stay away from red ones in general to be 100% safe. There are a few red edibles in this family though, and the taste test will quickly let you know if you have one of the sickeners. The Geranium Scented Russula is considered the most toxic in the family and it will make you very sick for a couple of days, but only if you eat one, not nibble a bit and spit it out. This mushroom is very hot on the tongue. As the name suggests, it smells of geraniums, so learn what geraniums smell like, and be wary of off yellow caps and you should be able to ID this one safely without even using the nibble test. But again the nibble test will quickly let you know if you have a Geranium Scented Russula. !!!!!!!!!!!!!!!!!!!!!! NEVER USE THE NIBBLE TEST FOR ANY OTHER FAMILY OF FUNGI !!!!!!!!!!!!!!!!!!!!!!!! I must have nibbled thousands of Russula in my life so far, and have personally never had any ill effect from doing so. Though be aware you use the contents of this article at your own risk. The edible Russulas all smell and taste edible. 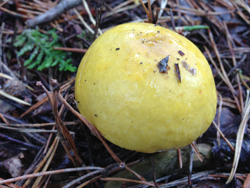 With the common yellow Russula having a bit of a peppery kick. 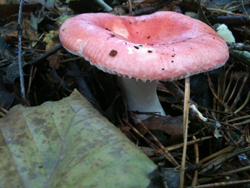 Some of the ones not to eat will smell caustic or like the Fetid Russula not very nice at all.